Abstract. Complex models of the atmosphere show that increased carbon dioxide (CO2) concentrations, while warming the surface and troposphere, lead to lower temperatures in the stratosphere and mesosphere. This cooling, which is often referred to as “stratospheric cooling”, is evident also in observations and considered to be one of the fingerprints of anthropogenic global warming. Although the responsible mechanisms have been identified, they have mostly been discussed heuristically, incompletely, or in combination with other effects such as ozone depletion, leaving the subject prone to misconceptions. Here we use a one-dimensional window-grey radiation model of the atmosphere to illustrate the physical essence of the mechanisms by which CO2 cools the stratosphere and mesosphere: (i) the blocking effect, associated with a cooling due to the fact that CO2 absorbs radiation at wavelengths where the atmosphere is already relatively opaque, and (ii) the indirect solar effect, associated with a cooling in places where an additional (solar) heating term is present (which on Earth is particularly the case in the upper parts of the ozone layer). 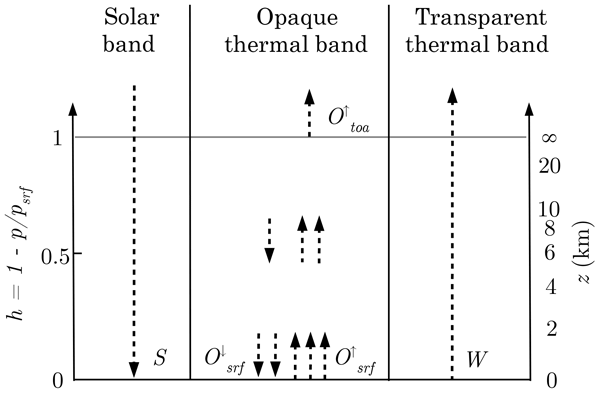 By contrast, in the grey model without solar heating within the atmosphere, the cooling aloft is only a transient blocking phenomenon that is completely compensated as the surface attains its warmer equilibrium. Moreover, we quantify the relative contribution of these effects by simulating the response to an abrupt increase in CO2 (and chlorofluorocarbon) concentrations with an atmospheric general circulation model. We find that the two permanent effects contribute roughly equally to the CO2-induced cooling, with the indirect solar effect dominating around the stratopause and the blocking effect dominating otherwise. How to cite: Goessling, H. F. and Bathiany, S.: Why CO2 cools the middle atmosphere – a consolidating model perspective, Earth Syst. Dynam., 7, 697-715, https://doi.org/10.5194/esd-7-697-2016, 2016. Carbon dioxide, while warming the Earth's surface, cools the atmosphere beyond about 15 km (the middle atmosphere). This cooling is considered a fingerprint of anthropogenic global warming, yet the physical reason behind it remains prone to misconceptions. 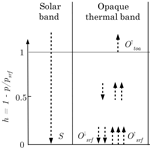 Here we use a simple radiation model to illustrate the physical essence of stratospheric cooling, and a complex climate model to quantify how strongly different mechanisms contribute.